impressive party recipes, the easy way. 'Pão de alho' - or garlic herb butter bread - has long taken its place as staple party appetizer back in Portugal, greatly owing to two facts: first, everybody loves it; second, even the laziest and messiest cook can pull it off, as you can easily buy it frozen and pop it into the oven right before your guests arrive. However, if you're looking to step up your 'pão de alho' game a little bit and impress your guests - without getting way too adventurous for starters - I've got just the thing for you. If kneading your own bread dough by hand, watching it rise over time and having your house drenched with the inebriating scent of freshly baked bread has got something of love to it, there is no love quite like making a brioche. It's a tough job. It requires greater amounts of patience, arm strenght and time. Results always make up to all of that trouble, no doubt there, but don't you sometimes wish you could cut to the chase by having your brioche and skipping kitchen "arms-day" at the same time? Many brands currently provide solid ready-made brioche flours you can work with and achieve great results. Don't get fooled: that neither means that you have to stick to the recipe that comes on the package, nor that you need a bread machine. Using the packaged brioche flour simply cuts down on waiting times and on manual work. And yet we'll be making it way more interesting by not sticking to a regular brioche loaf. Once you finish reading this post I hope you'll be absolutely confident you can make your own brioche, pimping it however you'ld like, and even willing to try it already tomorrow! When not using the oven for a main course, this is the perfect recipe for parties. I've made it twice and it was always the first thing to disappear from the table. Better served warm, but you can still take it to a picnic or a BBQ. Feel free to experiment with different spreads! brioche pull-apart de manteiga de alho. ou um pão de alho com a mania. Numa taça grande, juntar a água, o açúcar e o fermento. Deixar repousar durante um par de minutos. Adicionar as primeiras duas chávenas de farinha e bater com a batedeira com as espirais acopladas em velocidade baixa até obter uma mistura homogénea, tendo o cuidado de ir juntando a massa das paredes à mistura. Este passo pode naturalmente ser feito à mão. Juntar a restante farinha e amassar novamente, durante cerca de 5-10 minutos, até obter uma massa macia e elástica, que se descole das paredes da taça. O amassar também pode igualmente ser feito à mão, mas será necessário trabalhar a massa o dobro do tempo. Moldar uma bola com a massa, reservar numa taça ligeiramente untada com óleo e coberta com um pano durante cerca de 2 horas em local morno, até ter crescido para o dobro do tamanho. Deitar a massa sobre uma superfície limpa e ligeiramente enfarinhada e deixar repousar cerca de 5 minutos. Entretanto, untar uma forma de bolo inglês com um pouco de manteiga ou margarina. Numa taça, misturar bem a manteiga, a massa de alho e os orégãos. Com a ajuda de um rolo, estender a massa num rectângulo com cerca de 0,5 a 1 cm de espessura. Espalhar a manteiga preparada sobre toda a superfície e cortar em quadrados mais ou menos regulares, ligeiramente menores que a secção da forma de bolo untada. Empilhar os quadrados e colocar dentro da forma, como se de fatias de pão já cortadas se tratassem. Cobrir com um pano e deixar em forno a 50ºC (ou à temperatura ambiente) mais 1 hora. Levar ao forno pré-aquecido a 180ºC durante cerca de 45 minutos, ou até se apresentar dourado, resistente ao toque e soar oco. Retirar do forno, deixar arrefecer e desenformar. 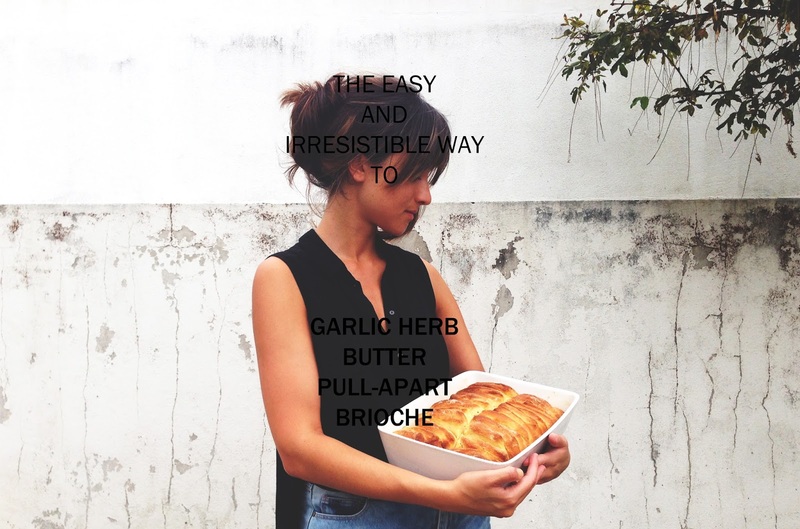 garlic herb butter pull-apart brioche. or how to step up your game on the traditional appetizer. In a big bowl, toss the sugar, yeast and water. Let rest for a couple of minutes. Add the first two cups of flour and beat with the electric mixer, using the paddle attachment, being careful to incorporate all the flour that may rise to the sides of the bowl. The kneading can also be done with the hands. Add the remaining flour and knead again, for about 5-10 minutes, until the dough is soft and pliable, unsticking from the sides of the bowl. This kneading can equally be done with the hands, yet that requires the double of the time. Shape the dough into a ball. Place in a bowl, slightly greased with oil and cover with a clean cloth. Let rise for about 2 hours in a warm place, until it reaches the double of the initial size. Sprinkle a clean working surface with flour and place the dough on top of it. Let rest for 5 minutes. Meanwhile, grease a loaf cake pan with butter. In a bowl, mix the butter, garlic paste and oregano. With a rolling pin, roll the dough down to a rectangle about 0,5 to 1 cm thick. Spread over the prepared butter and slice down into squares, which should be slightly smaller than the section of the loaf pan. Pile the squares up and place them inside the pan, as if they were slices of bread. Cover with a cloth again and let rise in the oven at 50ºC (or room temperature) for about 1 hour. Bake at 180ºC for about 45 minutes or until golden. It should be hard on the outside and sound hollow. Remove from oven, let cool and unmould. 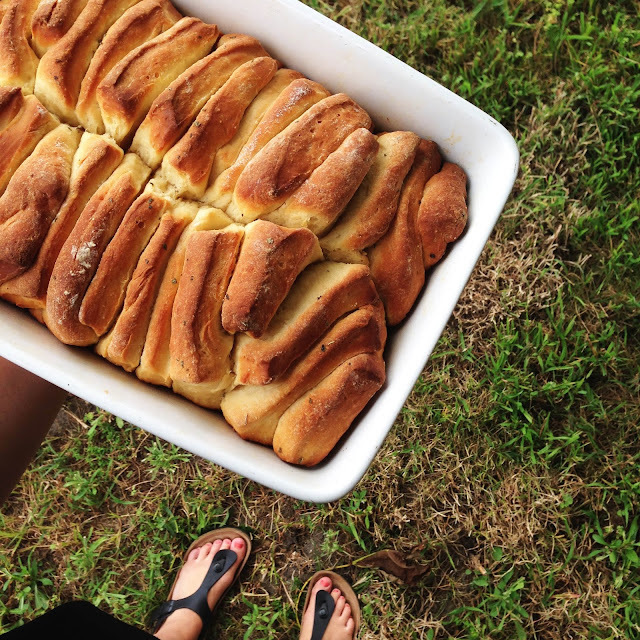 Awesome pullapart bread and beautiful clicks! Enjoy the lare summer weather and all that mother nature holds in store for us at this time of year!